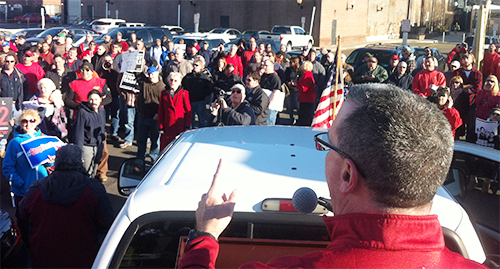 CWA's Mike Gendron leads hundreds in chants at a rally at Rep. Zeldin's office to urge him to say no to Fast Track. On March 6th, Long Island activists led by the Communication Workers of America (CWA) and representing a wide range of organizations met with Representative Lee Zeldin to urge him to commit to opposing Fast Track trade authority. At the meeting, Zeldin was noncommittal, but what Zeldin neglected to mention was that on that same day members Republican House Freshmen were sending an open letter to President Obama urging him to push Fast Track -- and Zeldin was one of the signers! Incensed, CWA and their allies organized a rally at Zeldin's attended by hundreds of Fast Track foes. TradeJustice's Adam Weissman (Global Justice for Animals and the Environment) and Lisa Oldendorp (MoveOn Long Island were among the speakers. You can read more about the rally in this article from CWA. Watch videos of the rally. View photos of the rally. The Hill website recently confirmed Zeldin's support for Fast Track in their Whip List. Join Long Island activists for a May 12th panel discussion spearheaded by Food and Watch Watch in Zeldin's district to learn about Fast Track and TPP and prepare for further action. Attend the funeral procession for US jobs on May 27th at Rep. Zeldin's office spearheaded by the Communication Workers of America. Contact Rep. Zeldin and urge him to defend US sovereignty and Consitutional separation of powers by opposing Fast Track for TPP! You can call (202) 225-3826, fax (202) 225-3143, use his webform (constituents only), or email him.